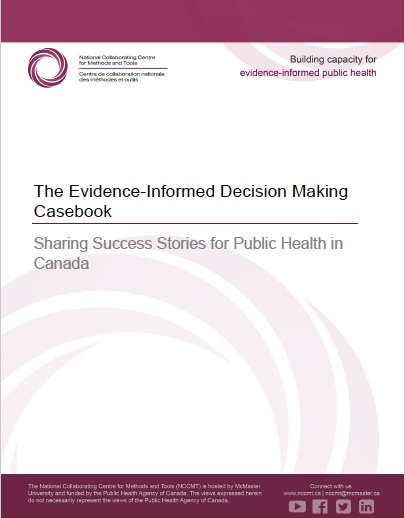 The National Collaborating Centre for Methods and Tools (NCCMT) recently released an EIDM Casebook featuring nine stories from public health professionals across Canada that highlight their use of evidence to inform public health practice, programs and policy. Click here to read these stories! Coming in September 2017, this new webinar series will explore how public health professionals from across Canada have used evidence-informed decision making in their practice. Each webinar will feature two presentations, including authors from the NCCMT’s EIDM Casebook! Faced with an apparent health inequity, this team advocated for change in policy that made the HPV vaccine available in the Catholic school jurisdiction. Learn more about how evidence was used to successfully influence change of a school board’s policy. Facilitating knowledge exchange of research evidence across a large organization can be a challenge! Learn more about how a program planning management officer at the Ottawa Public Health unit developed a centralized platform to simplify knowledge sharing and encourage evidence use across the unit. A growing population placed pressure on the availability of vaccination appointments at the Thornhill Community Health Centre in Calgary, Alberta. Learn more about how a team of nurses gathered evidence to inform and implement change to improve client care. To help improve the capacity of individuals and the health unit as a whole, an interdisciplinary team helped champion the use of evidence and foster an environment of learning at their health unit. Learn more about how a Community of Practice was developed within a large public health unit.